Are Chicago's shorter yellow lights unsafe, or just unfair? Pavel Gigov received a red light camera ticket at a North Side intersection where he felt the yellow light was too short. He says the city undermines public trust by ignoring best engineering practices with its traffic signals. Chicago’s red light cameras are under increased scrutiny, after a Chicago Tribune investigation found glitchy cameras may have issued thousands of tickets in error. The report also found many yellow lights are slightly short of the city standard of three seconds. WBEZ has been looking into yellow lights too — and we’ve found something else. Many traffic experts say Chicago flouts industry best practices with how it programs its traffic control devices — and one engineer says it may be “entrapping” drivers into running red lights. Should I run? Should I stop? Our inquiry started with Pavel Gigov, a North Side resident who, incidentally, is not a transportation engineer. Gigov drives a car, and like many of us, he’s gotten a red light camera ticket or two. He got one in April at an intersection he normally drove through on his way home from work, and thought something was strange. The intersection was at W Peterson Ave. and N California Ave., in Chicago’s West Ridge neighborhood. The streets are pretty wide: each has six or seven lanes across, and like many Chicago roads, the speed limit is 30 miles an hour. Gigov received his red light camera ticket at the intersection of W Peterson Ave. and N California Ave. Like many Chicago intersections, the streets have a speed limit of 30mph. Gigov said the moment he crossed into the intersection, he saw the flash of the red light camera going off. “And I knew that there was something that was going to be in the mail pretty soon,” he laughed. Sure, enough, Gigov got a $100 ticket in the mail. He paid it, but still, he wondered: wasn’t that yellow light kind of short? Chicago’s Department of Transportation says the city’s yellow light intervals “fall within the guidelines of the Federal Highway Administration’s Manual on Uniform Traffic Control Devices, and adheres to recommendations by the Institute of Transportation Engineers.” That’s half-true. First, the true part: the MUTCD does, indeed, recommend that yellow lights fall between 3 and 6 seconds. At the intersection where Gigov got his ticket, a frame-by-frame video analysis of the traffic signal showed that the yellow light lasts exactly three seconds — the minimum recommended under the MUTCD guidelines. But three seconds falls short of what the yellow light interval should be, if the city were to follow ITE recommendations as it claims. Gigov said he worries that in flouting best engineering practices, Chicago may put drivers at risk. Particularly at red light camera intersections, where each traffic violation could bring dollars into the city’s coffers. The city claims it implements a blanket policy on yellow light intervals, regardless of whether there’s a red light camera: three seconds when the speed limit is 30mph or lower, and four seconds when it’s 35mph or higher. “Chicago’s yellow times are more than adequate for a driver traveling the speed limit to react and stop safely,” it states on the CDOT website. The policy bucks a growing trend among transportation agencies nationwide. “The idea of a constant time is not typical,” said James Taylor, a retired traffic engineer in Indiana. While there’s no federal mandate that requires transportation agencies to follow a method in determining yellow light intervals, Taylor said more places are adopting a mathematical equation that has been developed by the Institute of Transportation Engineers. A 2012 survey of more than 200 transportation agencies in the U.S., Canada and Germany, found only 6 percent timed their yellow light intervals the way Chicago does. By contrast, the largest chunk — almost 40 percent — used the ITE equation. The ITE formula for the length of yellow lights factors in the specific conditions of an individual intersection, such as speed limit and the grade of the road. It also uses numerical assumptions based on extensive field studies. The equation assumes a perception-reaction time, t, of one second for the average driver, based on field measurements. In other words, it takes about that long for a typical driver to see that the light has changed to yellow, and to decide what to do. The fraction shown in the equation calculates how long it should take to decelerate to a stop, based on a typical driver’s approach speed (V), a comfortable deceleration rate (a), and the grade of the intersection. Traffic engineers recommend using the 85th percentile of approaching traffic to determine a typical approach speed. If that hasn’t, or cannot, be measured, a commonly accepted approximation is to add 7mph to the speed limit. Field studies have also found that a comfortable deceleration rate, a, for drivers is 10 ft/sec². In Chicago, the grade of the street, g, is negligible, so we assume it to be zero. Plug the numbers in for the intersection where Gigov received his yellow ticket, and it yields a yellow light interval, Y, of 3.7 seconds — that is, 0.7 seconds longer than it actually lasts. Studies show that could significantly change outcomes at an intersection. “Increasing the yellow by one second would decrease violations by 50-60 percent, and reduce crashes by 35-40 percent,” said Davey Warren, a transportation engineer who spent most of his career with the Federal Highway Administration. That agency has been pushing transportation departments nationwide to adopt the kinematic equation. In fact, in 2012 it made a change to the MUTCD that would require agencies to switch to engineering practices to determine yellow light intervals by mid-June of 2017. Many traffic engineers were surprised to hear that Chicago does not already use widely-accepted engineering practices to calculate its yellow light intervals. “There is a general rule with engineers, you should be following the best accepted practice unless they can document valid reasons for not doing so,” said Warren. WBEZ requested multiple times to interview someone at Chicago’s Department of Transportation. The department didn’t respond. The department also failed to respond to a request under the Freedom of Information Act for its programming instructions for traffic control devices. But before you worry that the city’s putting drivers at risk by skimping on yellow light times, there’s a twist. In addition to recommending a mathematically-derived yellow light interval, transportation engineers also recommend something called an all-red interval. That’s a brief moment after the yellow light, where the lights are red in all directions. It gives a chance for cars still caught in the intersection to finish crossing before the opposing traffic gets a green. It’s worth noting that there’s some debate over subtracting the number 1 on the right side of this equation. The ITE contemplates both possibilities. The NCHRP study found in field studies that it typically takes one second for drivers to perceive and react to a change to green after the all-red interval. So in its conclusions, it recommends subtracting that reaction time, to keep traffic flow more efficient. Across transportation engineering literature, the standard length of a vehicle, L, is 20 feet, and again, the approach speed is approximated by adding 7mph to the speed limit. At Gigov’s intersection, where the streets were approximately 60 feet wide, the formula above yields an all-red clearance interval of 0.47 seconds. That means a vehicle that was caught in the intersection when the light turned red, would still have about half-a-second to finish its transition before opposing traffic gets a green light. It turns out, the actual all-red clearance interval at the intersection of W Peterson Ave and N California Ave alternates between one and two seconds. Both of these are much longer than the formula recommends. At a typical intersection in Chicago, where speed limits are 30mph, the city sets yellow lights at three seconds, followed by an all-red clearance interval of at least one second. By comparison, best engineering practices recommends a yellow light of 3.7 seconds, followed by an all-red clearance interval of .47 seconds. Experts say that while the total clearance times are close (4 seconds and 4.17 seconds, respectively), the misallocation of time between the yellow and all-red intervals may entrap drivers into more violations. Data on actual yellow lights from CDOT’s website and field measurements at intersection of W Peterson Ave. and N California Ave. Recommended calculations based on the kinematic equation developed by the Institute of Transportation Engineers. 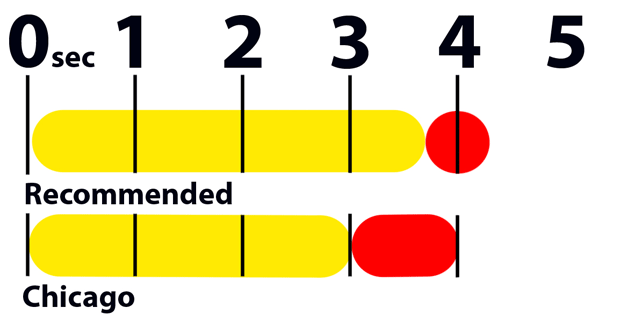 Together, the yellow light and the all-red interval add up to what’s called a “change period.” That “change period” at the intersection where Gigov got his ticket equals the three-second yellow light, plus one or two seconds for the all-red interval -- a total of four or five seconds. Engineering practices would yield a nearly similar result: a 3.7 second yellow light, followed by 0.47 second all-red interval, totaling 4.17 seconds. The difference is, Chicago shortens the yellow portion of the change interval, and lengthens the all-red portion. In other words, Chicago’s yellow light intervals may not be unsafe, but they may be unfair. Gigov said if the city wants to win back public trust when it comes to its use of red light cameras, it should use to the most up-to-date engineering guidelines when it programs its traffic control devices. “You’re the city of Chicago, and your fiduciary duty is to serve residents of the city, and not to increase the revenue in such a borderline shady way,” said Gigov. Last year, anger over red light camera tickets in Florida prompted a reexamination of yellow lights. It turned out, yellow lights in that state were also timed contrary to engineering formulas. So Florida’s Department of Transportation mandated the lights be lengthened. Gigov said he hopes Chicago will do the same.